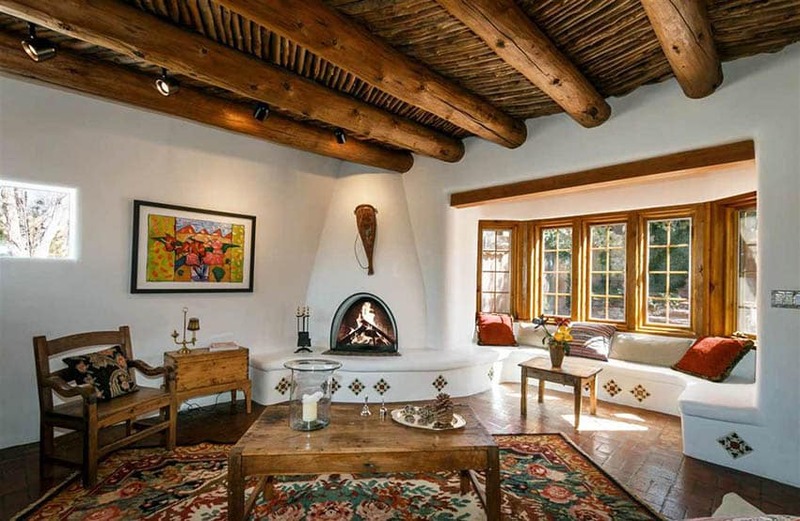 Welcome to our gallery focusing on rustic living room ideas including a variety of furniture, decor and paint colors. “Old” is the new “New”. The classic style of natural finishes, massive furniture pieces and heavy textures makes a comeback in the interior design scene, in fusion with more contemporary styles to create a luxe yet homey feel. 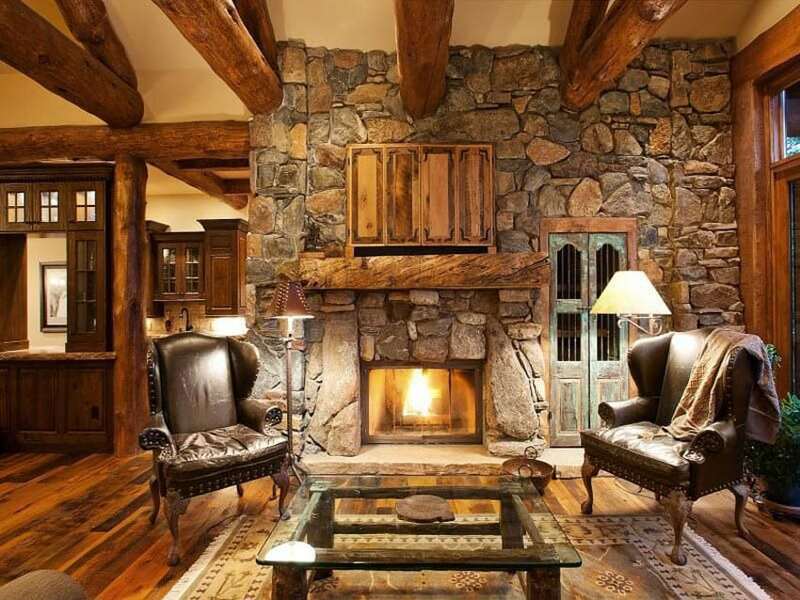 Rustic interior design is all about embracing natural materials in their most natural state – finishes, colors and shapes of materials are kept as natural as possible – and even the imperfections of these materials are left alone. 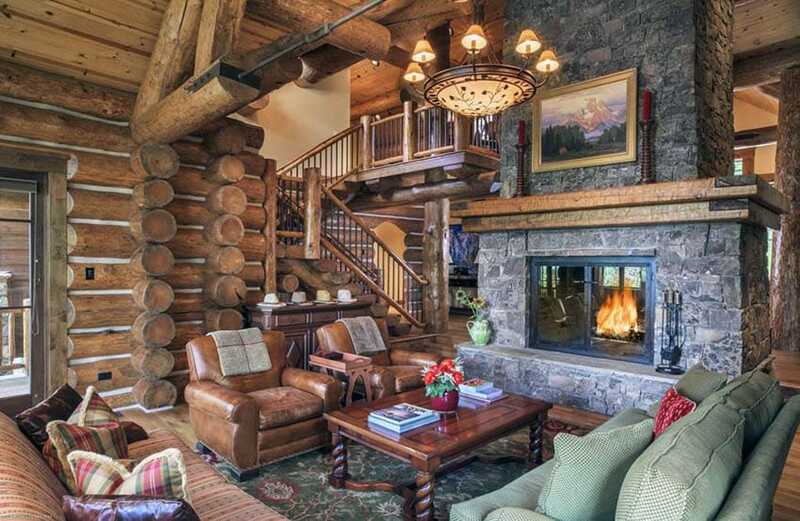 Most importantly, rustic interiors gives a homey & cozy ambiance. It should feel relaxed, ‘at home’, casual and unrestricted. 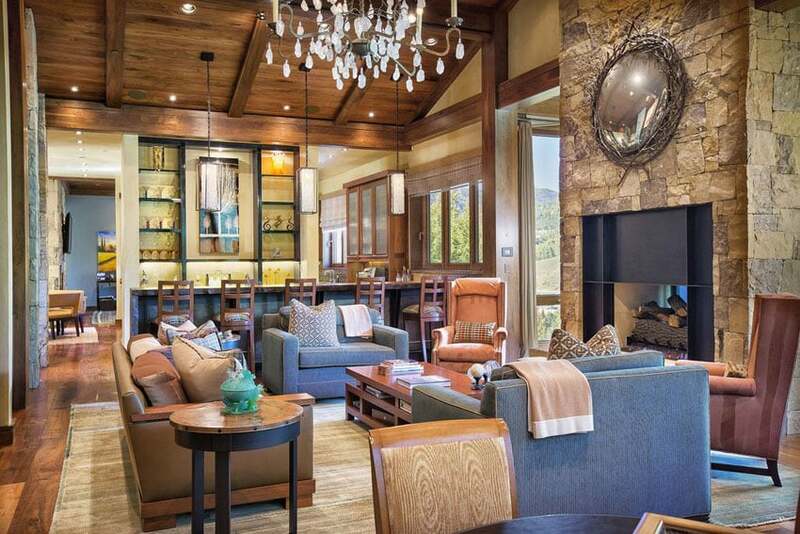 Forget about your OCD with symmetry, perfectly-pressed fabrics and spotless surfaces, as rustic interiors embraces the signs of use and age on its furnishings and finishes. The rustic style is perfect for people who want a laid-back and fuss-free interiors that has a “lived-in” feel. It should have a very relaxed atmosphere and often reflects the personality and taste of its owner. For those who love collecting various items, travel knick-knacks, etc, rustic style interiors is a good choice as it basically lets you embrace eccentricity & eclecticism. Emphasis on the use of natural materials – wood, stone, etc. Upholstery – often uses warm-tone colors such as browns and beige, or any muted/grayed-down color. Prints can also be used, but usually uses classic tapestry patterns. Fabrics can range from linen, cotton, suede and even leather. Textured fabrics are often preferred. Metal – metal can also be found used on furniture pieces, but instead of stainless steel or chrome-plated finishes, you would usually find blacked bronze, brass, antique gold and wrought iron. Wooden pieces such as coffee tables, side tables and console tables are also often bulky & heavy, and made from solid wood. Lamps – chandeliers, floor lamps and table lamps are the usual lighting features of rustic living rooms. They are often made from metal or wrought iron in various rustic finishes such as blacked bronze, brass, rustic gold, etc. Wood can also be used, as well as colored glass. They usually have a more organic and curved silhouette. Accessories – antique style accessories are often found in rustic designs, and you can also use natural items such as shells, unique rocks/stones, rattan balls, handwoven fabric throws, etc. Candles, plants and paintings are also common accessories used in rustic interior design. You can also explore taupes, warm-toned grays and other similar colors to match the mood you want to achieve. 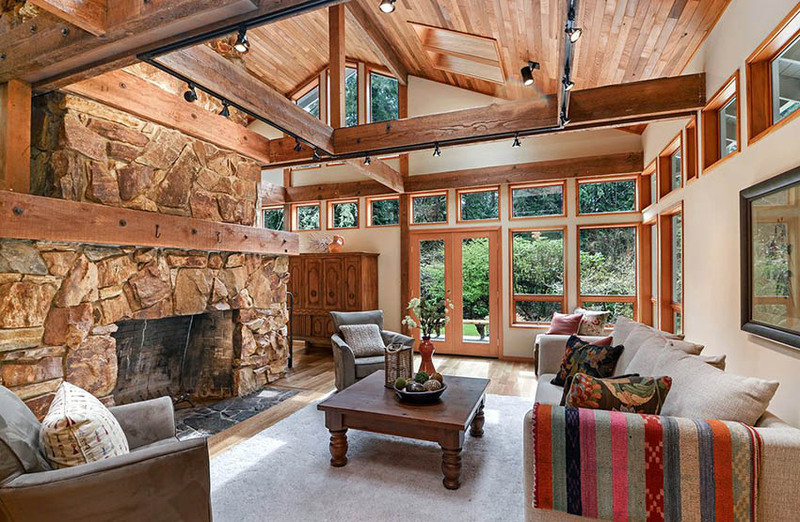 Below are some great examples of rustic style living rooms you can take inspiration from. 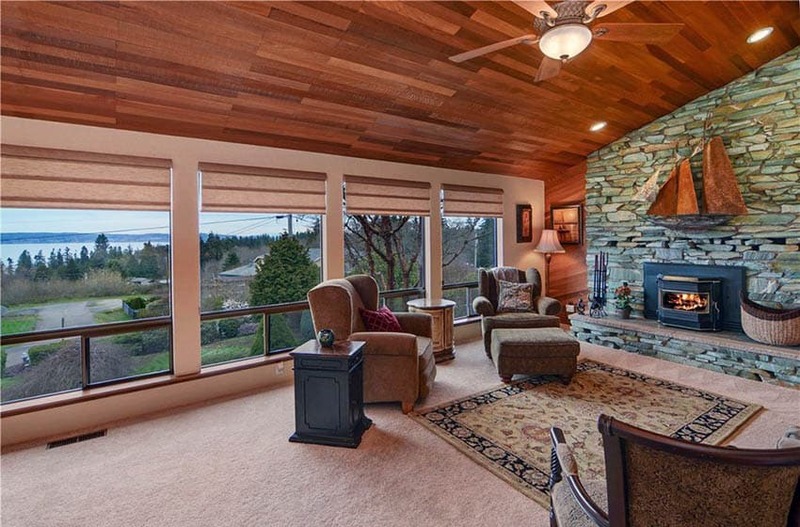 Going for a log-cabin inspired look, this living room uses cut logs as a finish for the wall to create a faux log wall. 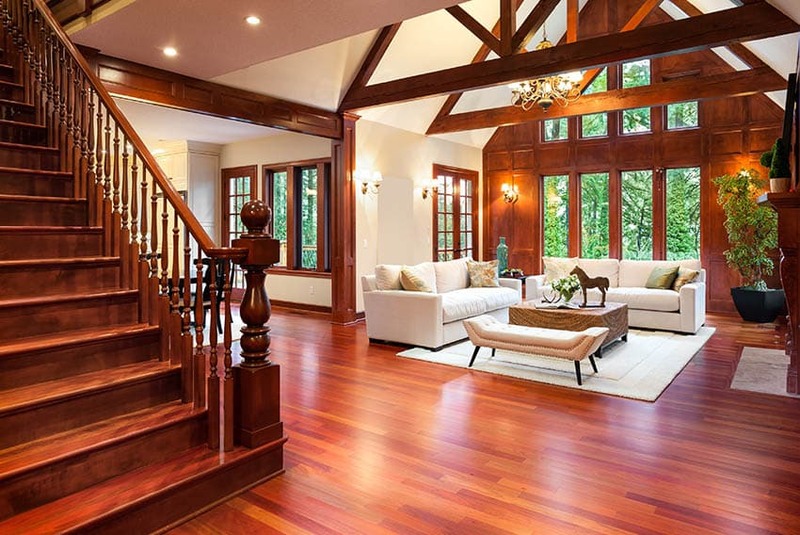 You can also see the use of natural wood flooring, as well as exposed wooden trusses for the high sloped ceiling. Standing in the middle of the living room is a massive fireplace clad in natural slate stone with a rustic wood mantel. Furniture pieces are classic style pieces with notable characteristics such as scroll arms and solid wood pieces with turned legs. The color scheme is mainly brown-toned because of the walls, floors and ceiling, so to add a bit of contrast, an emerald green traditional area rug and green-upholstered sofa were used. Going for a more elegant look, this rustic living room boasts of its elegant marble flooring and fireplace, as well as a high sloped ceiling with decorative wooden trusses made with reclaimed wood. The walls are painted in an off-white shade similar to Creamy by by Sherwin Williams to give it a bright and light ambiance, while furniture pieces also uses muted cream colors. High ceiling and large windows definitely make this living area look bright and welcoming. It uses a light off-white color for the walls, and natural wood-framed doors and windows, paired with birch wood plank ceiling and solid wood trusses. Because of the light-colored wood finishes used on the space, it doesn’t look too heavy and the high, sloped ceiling with skylight keeps everything balanced. The massive fireplace is still the focal point of this room, as its natural stone finish stands out against the other finishes. Furniture has a simple and casual layout, using beige and taupe upholstery with bright-colored throws and pillows for accent. Plain white walls and curved corners and edges makes this living room very much reminiscent of Mediterranean interiors. The walls were decorated with patterned concrete tiles, and has a built-in bench and fireplace, making it blend with the wall surface. Instead of an actual sofa, the bay window bench serves as the seating area, adding a few pieces of pillows and a large window to make it feel more cozy. The terracotta flooring gives the space a very rustic appeal, while the traditional area rug gives it a pop of color that matches with the colors on the concrete tiles. The brown wingback leather armchair placed by the stone-clad fireplace definitely gives this living room a very classic gentleman feel, but with the nicely weathered wood finishes, it gives a more casual and laid-back vibe. The warm colors and lighting makes you want to sit by the fireplace and read a good book. 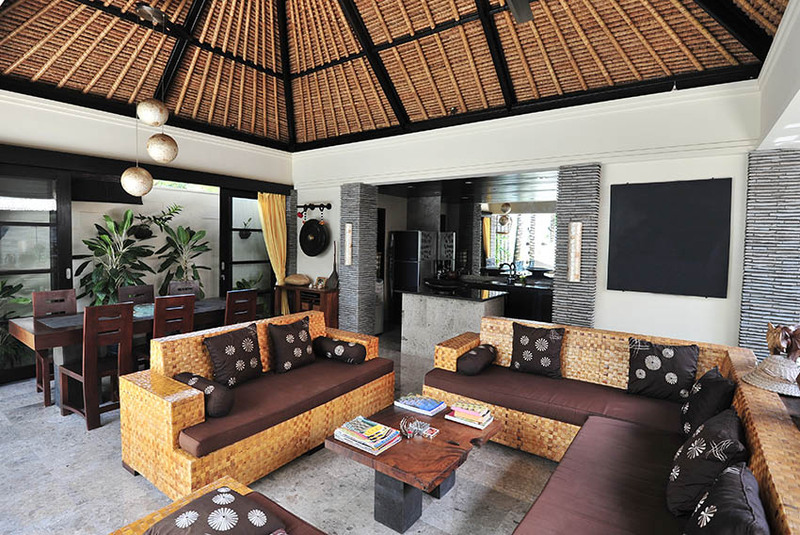 This rustic living room has a modern tropical aesthetic inspiration. The texture and color of the thatched roof is left exposed to add more color and texture to the space, while the black-painted metal trusses gives a nice contrast balance that also matches with the door and window colors. 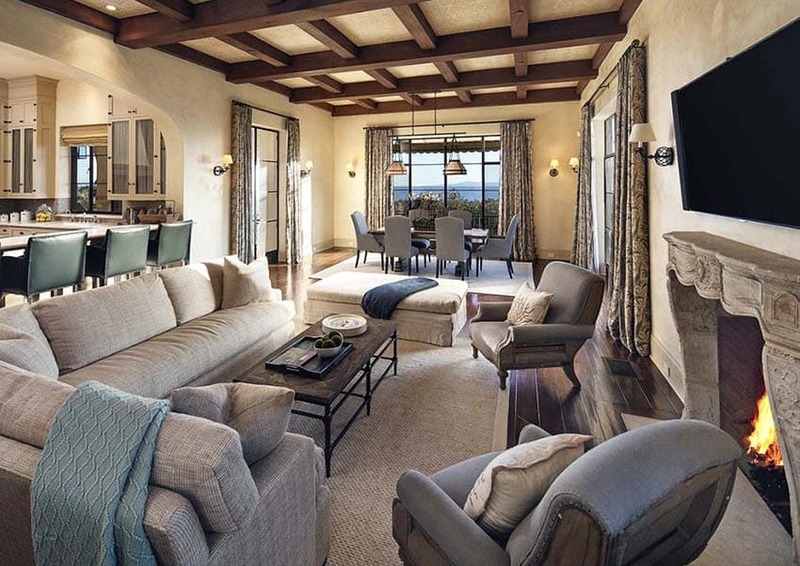 Exposed solid wood beams and planks on the ceiling gives this living room much more depth and personality. The living room has Empire style influence with its furniture pieces, but keeps a light, neutral color palette to complement the white and marble finish of the room. Golden satin and some light yellow gold accessories adds more elegance to the whole look. This living room is a modern take of the rustic living room look. The attic sitting room has a nice sloped ceiling which was finished with wood planks to mimic the exposed wood ceiling of older structures. For the fireplace, natural stones were also used for the mantle, but the fireplace itself is a small gas fireplace that conveniently fits into the small space. Elegant high pitched roof gives the living area a feeling of a bigger space, despite it’s actual small size. The large windows couple with white walls also helps balance out the strong color of the cherry wood finishes on the floors, walls and ceiling. The furniture pieces ops for a very simple and casual look, upholstered in white with a massive solid wood coffee table for accent and some plants to go along with the nature backdrop. Aged oak ceiling and massive beams and trusses already sets the nice rustic mood for this living room. Because the massive beams paired with wooden flooring looks a little “heavy”, walls were simply painted in white, helping create a balance that makes the room look big and bright. Furniture pieces are composed of two modern sofas upholstered in white, an antique Spanish coffee table with a glass top and a matching antique wingback chair with a nice yellow leather upholstery placed right by the limestone fireplace. If your current interiors / architecture is more on the modern side, or you simply prefer the cleaner silhouette of modern designs, you can still add a few touches and details to give it a more rustic look. 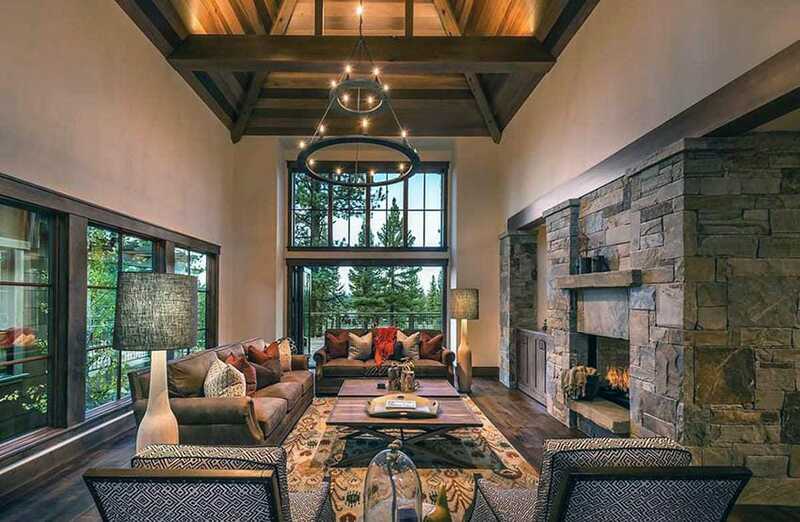 By adding ornamental solid wood beams to the ceiling, it mimics the typical ceiling look of rustic interiors. The slate fireplace also helps put together the whole look, as well as the rustic inspired decor such as the dried flowers, candles and the neutral-colored furniture pieces. By adapting the right colors and textures, this modern living room was able to capture the ambiance of classic rustic interiors. A neutral color scheme with wooden flooring, taupe walls and rustic wood ceiling, combined with the beige and brown tones of the velvet and leather furniture pieces, as well as rustic wood pieces really come together well. The massive fireplace definitely is the focal point of this living room, as it takes all your attention with this rough solid masonry finish. The living room has a nice cozy and casual feel, using contemporary furniture silhouettes with a rustic-inspired material palette of velvet chocolate brown and beige suede. The pitched ceiling with light pinewood finish also helps complete the rustic look, but gives a more contemporary appeal with its lighter wood finish. 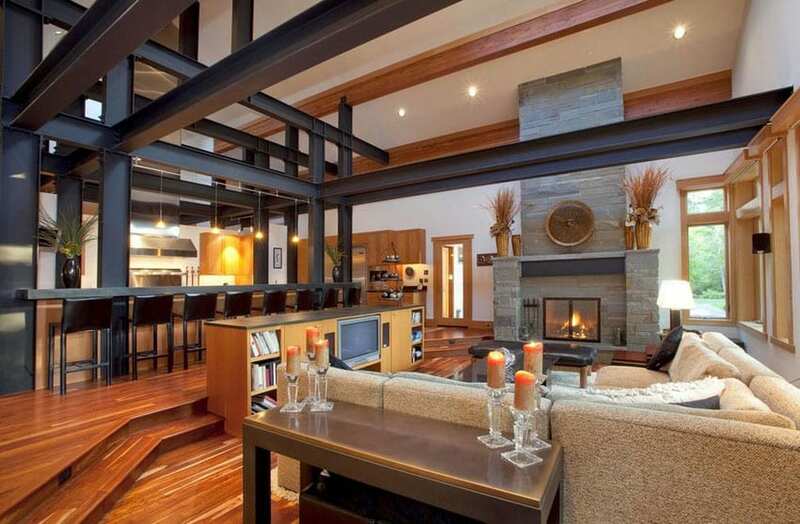 Despite being rather small, the open floor plan makes this contemporary living room still feel bright and spacious. The fabric and wood textures used on the furniture pieces really give a very casual rustic vibe, because of its more modern silhouette. More playful and bold with its color selection, this rustic-inspired contemporary living room successfully combines the modern retro color scheme with rustic finishes. 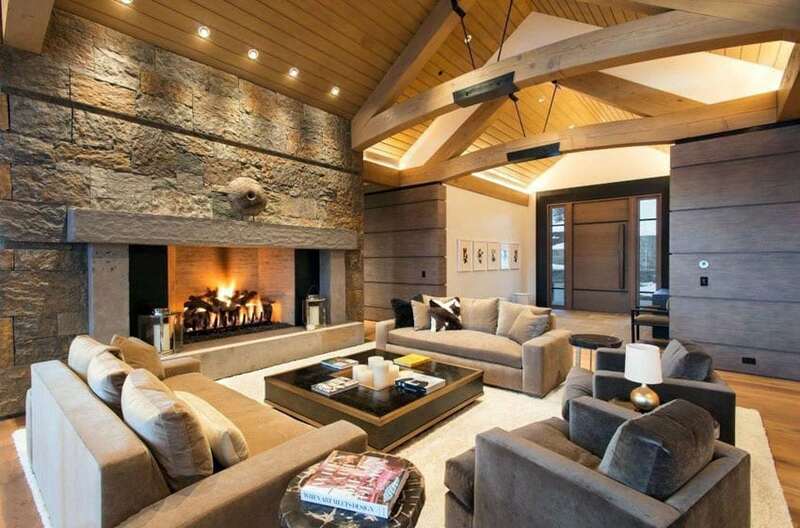 The solid wood floors and pitched ceiling, paired with the stone-clad fireplace gives it a very rustic vibe. The furniture pieces have a more modern silhouette and a bolder color scheme of browns, dark blues and oranges, giving it a more youthful appeal. For those who prefer a more farmhouse-like rustic appeal, the trick is going for more washed-out / weathered finishes, paired with simple, mostly white pieces. The solid wood ceiling trusses has a washed-out coloring perfect for the farmhouse look. The walls, doors and windows are also all in white, and to add a bit of a color, suede brown armchairs and rustic wood tables were added. This living room features an interesting mix of antique French furniture pieces paired with rustic wood finishes on the floors, wall and ceiling. The dark oak wooden floors has a very natural worn-out look, while the walls were finished with vertical wooden planks with a weathered white paint finish. 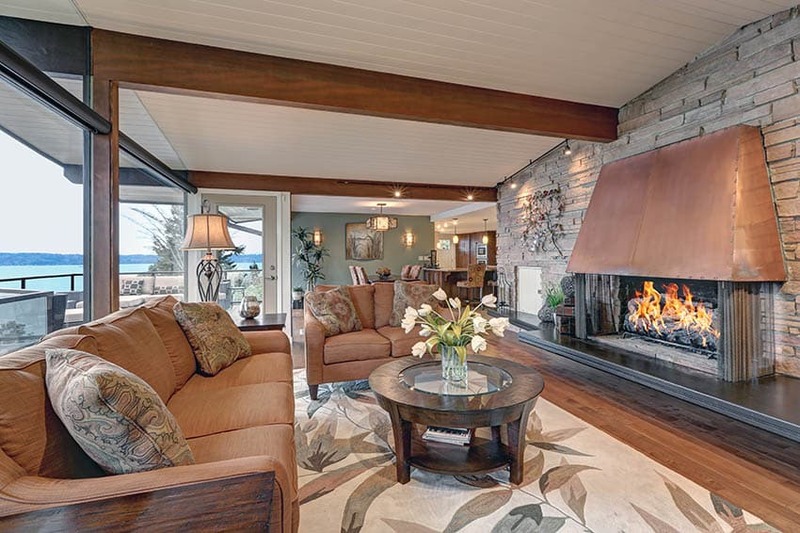 Solid weathered wooden beams can also be found on the ceiling, complementing the worn-out appeal of the floors. The white French furniture pieces on the other hand adds a touch of elegance to the space, creating a very romantic, shabby-chic appeal.